Ayla, you are now a monk, a disciple - you are prepared. Your studies are now complete. These are your instructions: remember the way of Shaolin, the true reflection of wisdom. Respect the way. Be true Shaolin. Now you go out into the world. Always be merciful. Practice kindness. 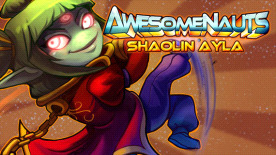 This DLC contains a custom skin for Ayla in Awesomenauts, and will automatically unlock the character if you have not already done so.